Along with Jackson Pollock, Willem de Kooning, Franz Kline, Lee Krasner, Mark Rothko and others, Grace Hartigan is internationally recognized for carrying figurative painting into abstraction. Conscious of the lesser regard for women artists and the male-dominated abstract painting group with which she was associated, she signed her early work ‘George Hartigan’. A breakthrough for her career was in 1950 when art critics Meyer Shapiro and Clement Greenberg selected her for the “New Talent” exhibition at Kootz Gallery. The following year, she had her first solo exhibition at Tibor de Nagy Gallery. Conscious of needing to have a style that was her own and not overly influenced by the artists with whom she was associating, Grace Hartigan decided to ‘paint her way through history’ and study the Old Masters, copy their work and utilize what she learned from those processes in her own painting. Pollock, Kline and Mark Rothko saw this as a defection from their commitment to pure abstraction, but she persisted in the face of their criticism and concluded that her paintings that truly expressed her leanings had to have “fragmentary elements from the real world”. Titles of her work from that period include Shop Window (1955) and City Life (1956). Primarily working with oil on canvas, or watercolor and collage, Hartigan uses bright colors, sometimes outlined in thick black paint reminiscent of stained-glass windows. 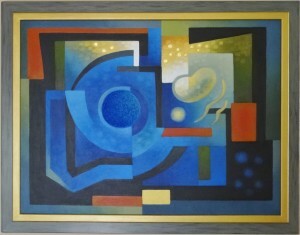 For more information about Grace Hartigan and to see samples of her work visit the Maryland Art Source website at URL: http://www.marylandartsource.org/artists/detail_000000124.html. For more Art Collecting Tips and Resources, be sure to visit our website and follow us on Facebook and Twitter.